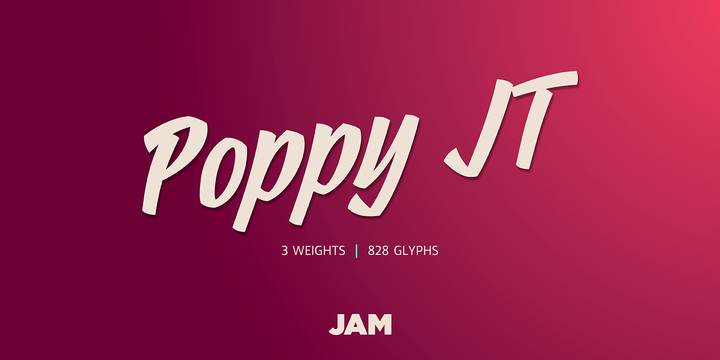 Poppy JT is a handwritten typeface created by João Symington and published by JAM Type Design which is available in 3 different weights (Regural, Medium, Bold), over 800 glyphs, ligatures, numerals, Symbols & Punctuation. This brush script it can be use for packaging, magazine, logo, branding etc. Have fun! Price: all 3 fonts only for $40,00. A font description published on Thursday, October 12th, 2017 in Fonts, JAM type Design, João Symington by Alexandra that has 1,680 views.